As a full service pool and spa company, we also offer the ability to build outdoor kitchens, clubhouses, gazebos, and other storage areas. 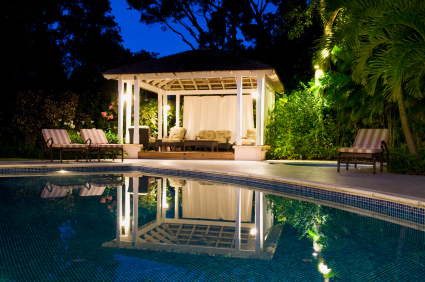 We realize that pools and spas have a way of attracting (and keeping!) your guests outdoors. So why keep the things that you use with your pool or spa inside? There are companies in the Metroplex that can build you a pool. There are companies in the Metroplex that can build you an outdoor kitchen. But how many can do both? Save money by using us for your pool AND your outdoor kitchen needs! Why keep running inside to cook (and missing all of the action!) when you can do all of the cooking poolside? Our outdoor kitchens have become one of our more popular builds as more people see the benefits and convenience of serving food outdoors. A clubhouse can also be a great way to improve your outdoor space. For guests who don’t want to swim, why not have a clubhouse that has a pool table and big screen TV in an air conditioned environment? Your house will be party central with one of our custom clubhouses. If a clubhouse isn’t your thing, maybe a gazebo is. Gazebos can provide a shady sitting area for guests as they eat and enjoy their time. If your house lacks storage, an outdoor storage container might be your best bet to store all of your pool stuff. We will gladly build you a storage area that blends in with your custom pool design and backyard space. Call us at 817-301-4467 if you’d like more information about our outdoor builds. Remember, your satisfaction is our #1 goal! I've been using Tri Star Pools for a long time and I have to say that they are good at what they do. They always seem to be on top of things, and very quick to respond with questions that I have. I trust them to ensure my pool stays clean and operating correctly. I definitely recommend their service to others.